The cat eye Evolve frames on the Smith Optics Sidney Sunglasses show that everything old is new again, because these stylish frames could not look any better. But not only will you be looking good in these, you'll be seeing good too because the ChromaPop+™ technology built into the lenses filters out certain wavelengths of light to give you improve contrast and color definition while you wear them, giving you even better vision that you’d have without the glasses. I have owned my sidney sunnies for almost a year now! they have been with me to california and to mexico and back! They are so cute and I have not seen anyone else wearing them! they're also very durable! They have fallen on the ground a couple of times and there is no dent or scratch on them! I have the matte black pair but I am in love with the Blush color! I might have to get those! over all, i would 100000% recommend these to anyone! thank you smith!! Cool color but not a great fit. I want to like these but they really do not look good on me. I have several pairs of the Colette and the Lowdown and the measurements did not seem that different but these are HUGE! I was deciding between these and the Comstock and I really wish I would have gone with the Comstock. The color is cool but combined with the size I look like a bug in these sunglasses. On top of that, they really hurt behind the ears. Frames fit great without being too tight--a really important feature for me. I hate when a frame is too tight along the temple. I bought the Flecked Blue Tortoise / Blue Flash Mirror. The color is a nice departure from normal tortoise shell and the mirror lense is great in the summer sun. Very fun and playful, only wish the lens was Chroma Pop and that more playful colors were available in the Rx program. I ordered these in the crystal and black, and I get compliments EVERY time I wear them. Three of my co-workers claim to be ordering them in the same colorway. They are super comfortable- lightweight, and fit my face well (I have a small face and these are just big enough to make a statement without looking like a bobblehead). LOVE LOVE LOVE. I ordered my first pair of the blue Sidney frames a few years ago. Currently I now own 3 with 4th on the way. I absolutely adore these frames and I get so many compliments on them! I wear them for a ton of things--driving, camping, trail running, SUP'ing, etc etc. It's really a do-all sunglass. I also love the retro-style look. My favorite color right now is the Flecked Mulberry Tortoise. I am a bit bummed I waited on the Black Havana Block, but oh well. I LOVE the chroma pop lenses. I received a pair as a gift a few years ago. The nose piece came off so I had put them aside. Once I got this new pair I remembered what I had been missing! My eyes are so happy when I put on these glasses. It feels relaxing to my eyes. The style is cute too! Not too sporty for wearing to work every day. I am always happy with SMITH products! I love the quality and the selection. Great glasses for style, vision and CHROMO POP! I get stopped by friends and strangers alike on the hill and street aksing me abbout these very cool glasses. I have worn Smith glasses and goggles for decades and never had so many compliments and "Oh Wow, where can I get those glasses?" 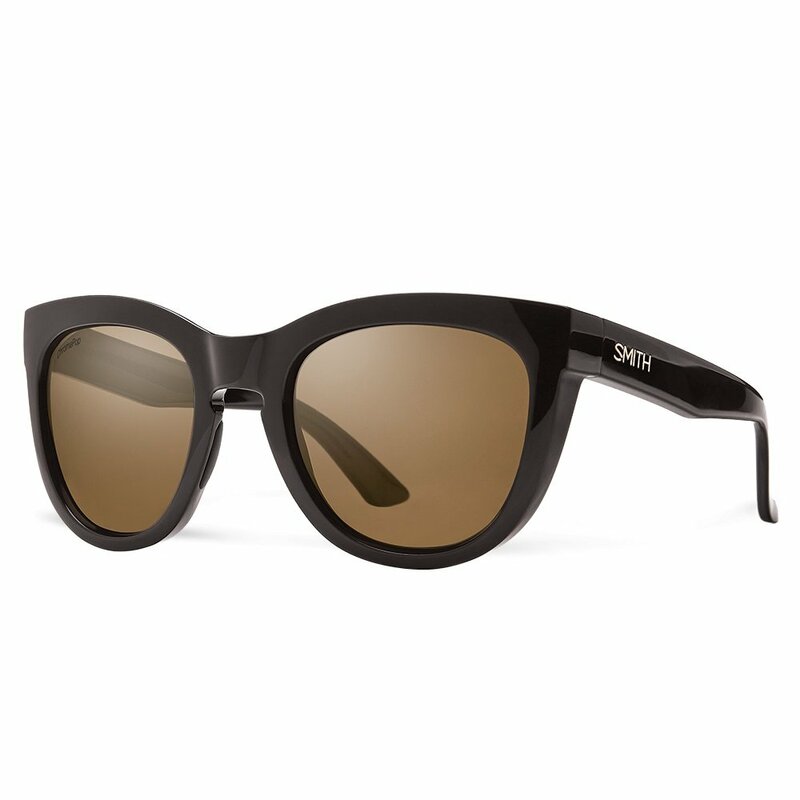 I have the Sydney model with Crystal Black Block frame and that is the color causing the ruckus. Great lens. Super cute. Too big for my face. My fashion-minded daughter LOVES LOVES LOVE them!!!! PLUS, she's getting tons of compliments on her Fashion Blog!! I have actually purchased these sunglasses three times now after travelling and losing them. They're sturdy, well made, well-fitting, polarized, and classy yet edgy. The matte finish adds a really cool element. Hopefully I don't have to buy them a fourth time, but I would if I had to!!! These glasses were comfortable, cute, and functional. I would purchase again.